Explore Force, Acceleration and Hooke's Law. No tools required. 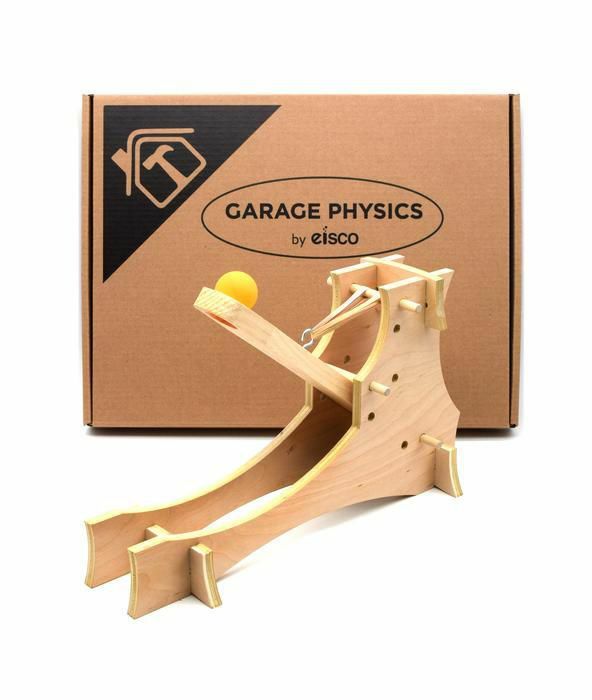 The Eisco Garage Physics High Power Catapult allows students of any age to explore the concepts of force, acceleration, parabolic trajectory, center of mass, Hooke's law, vector components, and class 2 levers while also providing hours of fun. The DIY kit is simple and quick to assemble, and includes adjustable parts to experiment with different initial conditions. Instructions included with the kit detail learning exercises and routes of further exploration. Everything needed to build the catapult is included. The wooden pieces are made from 3/4" pine and 1/2" plywood. This kit is sourced and assembled entirely in the United States, and correlates well with NGSS standards 3-PS2-1 and 2, MS-PS2-2, and HS-PS2-1 (Motion and Stability: Forces and Interactions).